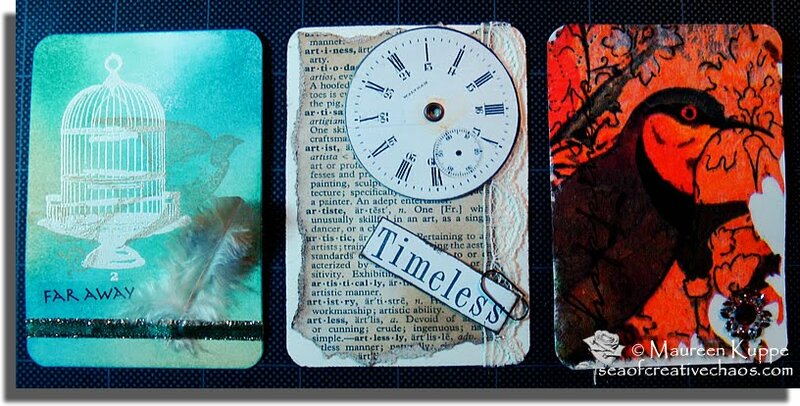 Here are my newest ATCs all ready to trade in April... yep, for ONCE I am ahead of the game! 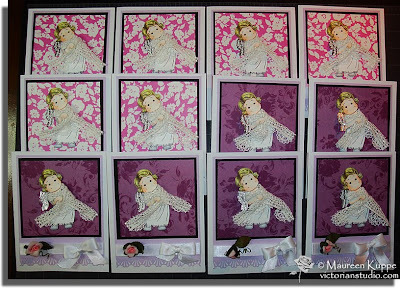 These are so easy and fun to do; when I am in the mood I can make a few on the same day. The first one is simply different coloured cardstock taped together on the back and run through a Cuttlebug. Easy peasy, but a nice effect. The second is made up of different vintage inspired papers inked and torn. I thought the wool tie was more fitting instead of a ribbon. The butterfly embellie is from K&Co. The third card is another white embossed / inked card. Another simple one with a piece of ribbon from my stash pierced by a flat brad. Last year my mom asked if I could make some cards for her church group. They make "prayer shawls" for parishioners and wanted some cards to go with each gift. So I made 12 at that time. The basic style is the same as the first dozen; inside and on the back are three matted pieces of information about the Prayer Shawl program, a quote and a presentation section for the name of the recipient (I didn't take a photo of those!). The fronts feature Magnolia's "Tilda with Violin". I cut off the violin and left arm so I could wrap her in a lace shawl. I am so glad they like them and also glad to have gotten them done on time! 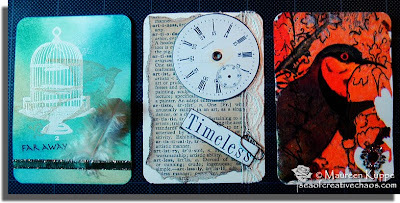 Here are some of my first ATCs. If you don't know, ATC stands for Artist Trading Cards. (Instead of going into the whole history of ATCs here, you'll find a lot of information online, including YouTube videos). 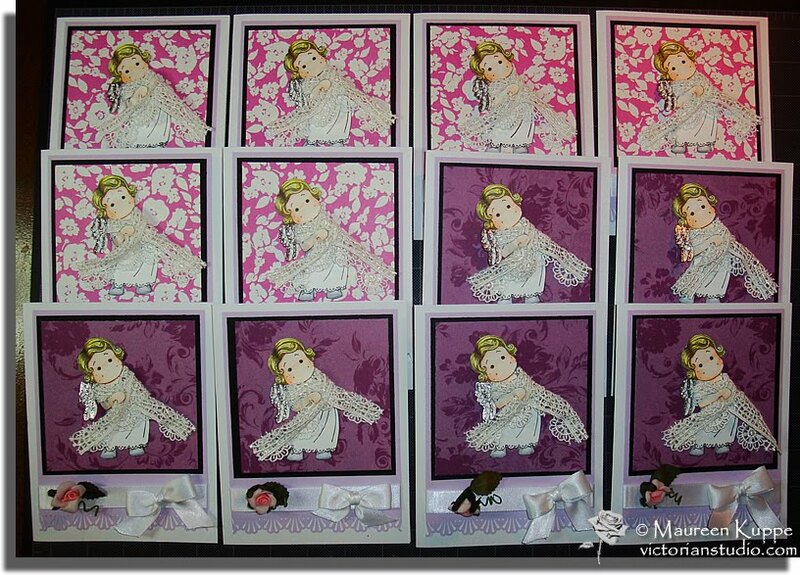 The first time I ever tried my hand at these was last fall when I entered a Christmas ATC swap and made 26 of the same reindeer card. 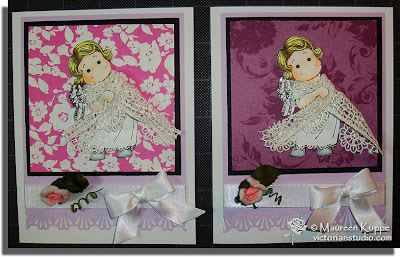 Recently, I joined an online ATC swap where you are asked to make three ATCs and send them to the same person. Each month the person you send to changes, for six months total. Of course, you receive 18 ATCs in return after the six months are up. I made these three for March: two of each design: one set I kept and one set was sent in the mail. On the first one I did a white embossed bird cage stamp, then I rubbed some Tim Holtz distressed inks for the background. I added another stamp of the bird on top. The text is a clear sticker. The feather is real and I added a ribbon layered with glittered ScorTape to hold it in place. The second card started out with two scans; I scanned and printed a dictionary page then tore and inked it to make it look old. Then I scanned my antique watch faces and cut one out, using my Cropadile to punch out the center and added a grommet. The sentiment is done with a set of Making Memories letter stamps, held onto the card using a small paper clip. A small length of lace was also added. The third card is a paper napkin! I love this image so I tore it apart and watered down some white glue to seal it on the card. I added a "happiness" stamp on the left side and a bit of bling with a self-adhesive jewel on the bottom. 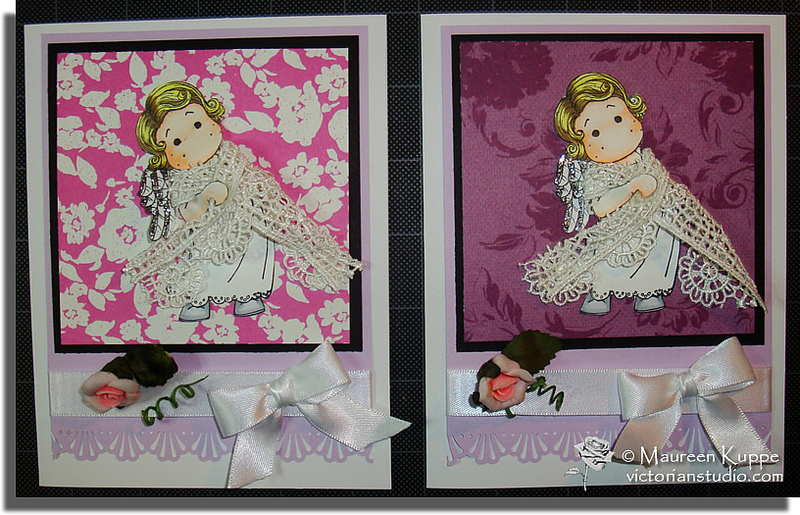 These cards are great fun to make; now I need to get started on what I am going to do for April! Finally the day had come... I've been waiting for the first big antique show of the year with great anticipation and of course, a Wish List for my studio. It's hard to believe that for the past 15 years, daughter and I have attended these shows together. Back then, we hunted down toys for my Star Wars collection. Now I'm looking for antique treasures! 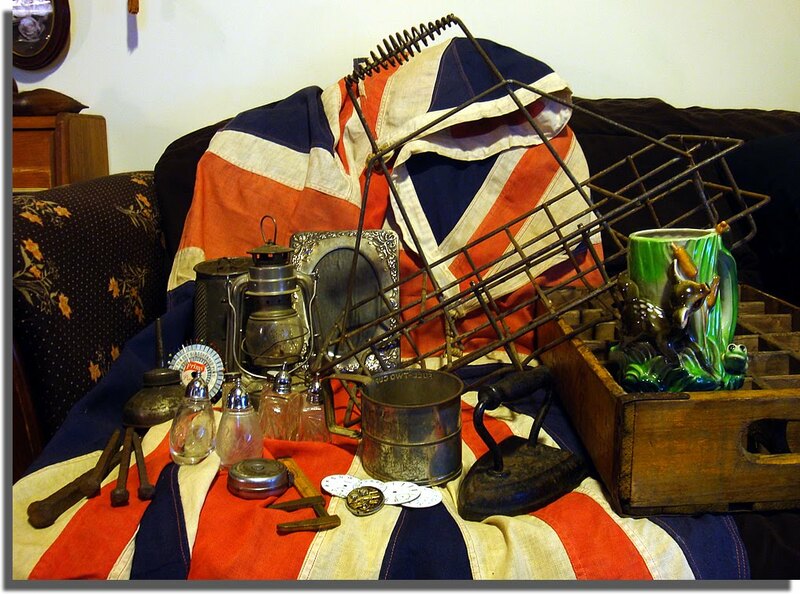 Some of the goodies I found include a silver framed photo album, three sets of salt and pepper shakers (for a display I will soon unveil), a primitive kitchen grater, oil tin, sifter and sad iron. I was thrilled to find a mini version of my old Wizard lantern and something off my Wish List: some antique glass headed pins. Other smalls found were an old metal tape measure, an English brass and wood caliper, ceramic deer mug and more watch parts. Always looking under the tables instead of just ON them, I discovered a wonderful old wire oil can caddy and a vintage Coca Cola box with dividers. One of the weirdest items I brought home were four rusty railroad spikes. I have a picture of an 1880 locomotive I used to work on, so I am thinking of adding these spikes to some kind of railroad display... methinks I need to find my old railroad cap! The best find was the very last. As we were preparing to head out for a nice breakfast we found an sweet old chap with a table full of war mementos from HIS father; uniforms, caps and the like. Now I don't collect those, but when I spied the Union Jack sitting beside them... 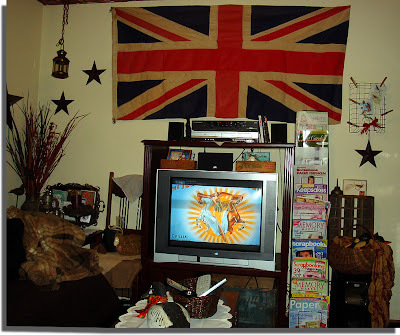 I fell in love.He made me a really good deal on the 75 year old flag. I couldn't wait to hang it in my studio. Yep, it was a GREAT day alright.